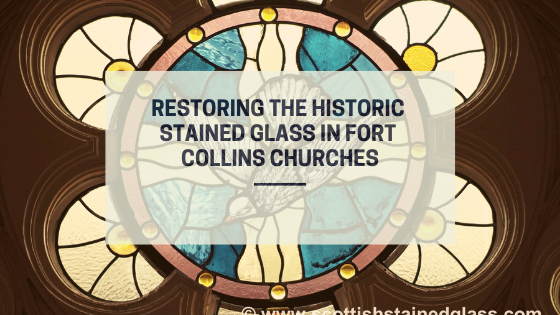 Historic stained glass in Fort Collins churches offers so much significance throughout both the community as well as for the congregation. Preserving historic stained glass is crucial in order to maintain the antique, monetary value as well as the sentimental value. Proper preservation for stained glass requires regular cleanings as well as restoration every 75 years to 100 years. With each restoration process, these stained glass windows can stay in great condition for another century until the next restoration is required. Restoring the historic stained glass in your church is really important for your congregation and community. The restoration process begins with removing the stained glass windows from your church and transporting them back to our repair studio. We soak your stained glass panels in our special soap blend for up to two weeks. This soaking process allows us to delicately remove all the dirt and grime that has built up over the last 100 years. The soaking process also facilitates us taking your stained glass window apart piece by piece. Each of the glass pieces that are still in great condition are carefully cataloged and put aside while we restore the damaged pieces and create new lead came for the entire window. We replace all of the damaged pieces from our extensive inventory. For painted glass, one of artists will replicate it and bake it in the kiln. Once new lead came and all glass pieces are reassembled, we force black cement into all the cracks for superior integrity. Once the black cement is set and your window is polished, we return your stained glass for re-installation. Congregation and clergy members tend to be stunned by the fresh, new look of their former stained glass. For more information regarding stained glass restoration, please contact us!